The Guardian reports today that Len McCluskey, general secretary of Unite, has come out in favour of Ed Miliband working with the SNP after the election. However, McCluskey was also careful to back the Labour Party – even under the leadership of Jim Murphy – saying “we’re a democratic party and of course we’re behind him and supporting his efforts to change.” He argued that the problem was that, whereas disillusionment with Labour was usually associated with abstentionism by working class people because they saw no alternative to it, the SNP was seen as offering a credible alternative in Scotland and Ed Miliband had a difficult task in trying to repair the trust that had been lost under New Labour. That’s an accusation that is levelled. My view is that they have undoubtedly changed the contours of the political scene and we have to respond to that, in particular the trade unions…. It’s not about the jury being out [on the progressive credentials of the SNP], it’s about us understanding what’s being said, watching the leadership debates – Ed Miliband has been impressive, Nicola Sturgeon has been impressive, others less so – but you’ve got to wait and see what the dice say and then critically look at how you can best defend working people…. Posted in: Labour, Politics, SNP, Trade Unions. The fact is ‘Unions’ have to ‘work’ with whichever Govt is in power for maybe up to 5 years or so, and their ‘supporters’. Unions, like any other organisation, don’t really have that much choice in the matter. The only time they can withdraw their relationship is when a facist or dictatorial Govt is power. McCluskey is like the Guardian writer last week who advocated working with the SNP and Nicola Sturgeon chasing a game which has to be more than tactical. Tactically, if Miliband needs SNP votes to get into Number 10, he should seek their support – the question is on what basis. 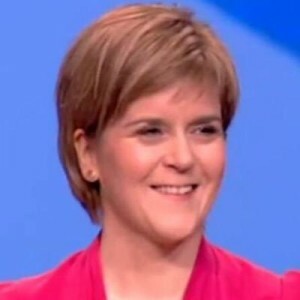 Nicola Sturgeon is not relevant, though the performance of the Scottish Eva Peron has been text book perfect. It will not be Sturgeon making the deals, but the less than fragrant Alex Salmond. He is however a feral politician of great skill and will persue his own agenda, that of his separatist party. If Miliband tries to run for 5 years on the basis of week to week deals, he gives Salmond the power to pull the plug as he chooses. Before the 2016 Scottish elections would be the key moment to cry “enough”. For Miliband to reverse the balance of power requires Labour to repeal the 5 year fixed parliament act. The experiment has been a failure, and no one can expect it to continue when there is no basis for a government with the SNP committed to destroy the union. So the first offer to Salmond is to vote for the repeal and reinstate the 1911 Parliament Act. After that, it is Miliband who can pull the plug. Simple but brutal political choices. At the moment, Labour is like a swimmer in shark infested waters, paddling desperately for home. But a shark (the SNP) has bitten off one of its legs. When – if – Labour gets onto the beach, the last thing it should do is do a deal with a feral force, and Salmond is just that, which wants to bite off its other leg. I agree absolutely with Len McCluskey on what he was reported to have said in that article, it makes historical and pragmatic sense, particularly in the context of his role as head of Unite (rather than as also a leading member and supporter of Labour). However, it is what he didn’t say (or what he wasn’t asked perhaps) that is the real issue here and the elephant in the room. Yes, if we have a minority Labour government that can be tacked left by some SNP support then good, no problem. But what else? A further attempt by the SNP to break apart the country and with it a very united working class (including in Unite)? What would that mean for Len’s members if the result was that Unite members on both sides of the new border were suddenly competing against each other and split on national lines? So yes, I would happily work with the SNP on various issues, but on the nationalist and reactionary bile that is their main reason for existence? Not a chance of supporting that, and Len needs to be clear what is at risk for his members and workers as a whole here. To reverse out of this trap, repealing the fixed parliament act is essential. WHat’s the problem? Perhaps the challenge for the SNP is to try make Labour and inch more progressive. And for a Pro-Union Labour perhaps the challenge is to make the SNP an inch more Federal? In 1933 the German nationalists put Hitler into power believing they had common cause and could control him. The Nazis destroyed them. Know your enemy. The SNP is clever and effective. Its aim is to destroy the UK. They love the idea of a progressive majority. Like Germany in 1933, the nationalist extremists need people to go along with them. Not that the SNP are Nazis, you can make a similar argument for the left Mensheviks in Russia in 1917-18. Lenin destroyed them too when it suited his bill. The aim is destruction. Of course, those who don’t agree with this can be very useful. I am happy to work with the SNP if they are on my wavelength. And with the Tories on defending the Union. All you need in politics is a very long spoon, there are many devils to sup with. On a purely tactical basis.